Blessed Homemaking: Confessions of a Cloth Diaper Convert Just $3 Today Only! Confessions of a Cloth Diaper Convert Just $3 Today Only! 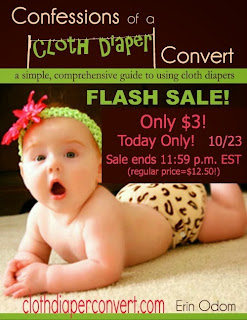 If you don't have it yet, today is a great day to get Confessions of a Cloth Diaper Convert. In honor of one of her daughters turning 3 today, Erin Odom is putting her popular and informative book on sale for only $3! The regular price of the book is $12.50, so this is a great deal...the best that will happen for the rest of 2013! This book was extremely helpful for me when deciding whether to, and then making the switch to cloth diapers. Read more about that here. No special coupon code is needed for the sale price. Just go to this link to purchase it, but remember it is only going to be on sale Wednesday, October 23rd and then will go back to its regular price!